The Paul’s company in Koln, Germany has a very long and interesting history when it comes to making pointe shoes by hand.According to the about page on the Pauls website, it all began way back in 1919. Theo Paul was an established cobbler working for the Cologne (Koln) Opera in Germany. Anna Pavlova was performing in the city at that time. Pavlova came in to Theo Paul’s shop to get a broken shoe repaired. Theo Paul not only repaired Pavlova’s shoe, but created a special pointe shoe model named after her, the Pawlowa. Almost 100 years later, Pauls still makes this model by hand. Fascinating, isn’t it? I love the history of pointe shoe making in Europe. Instead of the photos from the official Pauls.co website, I found another photo of the Pauls Pawlowa model. The Pawlowa comes in two different choices; satin or leather. Unfortunately, the website offers no information about the design features of these shoes. My German translating needs a lot of help, but I did notice different options for shanks and widths on the Pawlowa. 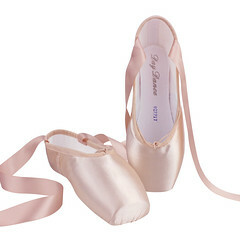 This is definitely a pointe shoe I would love to add to my collection! 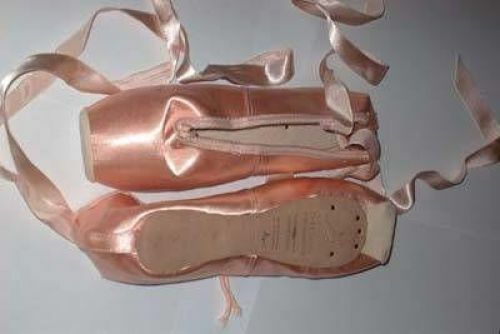 This entry was posted in German Brands and tagged Pauls Pawlowa, Pauls pointe shoes, Pointe Shoe Brands, pointe shoes made in Germany. Bookmark the permalink. Pauls Pawlowa comes in three materials (satin, leather, linen). Three colours (rosé, white, black). Optional steel springs. Optional anti-glide soles. Optional anti-glide tips. Three widths. Three grades of shank hardness. Kindly, Morton. Thank you for this information, Morton. The linen version sounds fascinating and the steel springs …well, let’s just say I have never heard of pointe shoes containing steel springs before. Very interesting! Thanks, and you’re welcome. I’ve just bought a pair of Pawlowas – I was keen to get them in black satin, but (possibly because of Black Swan) delivery time for that colour is 2 to 3 months at the moment. So, I got them in white (since a few pairs were reduced anyway) and used some silk paint, as advised. The result is surprisingly good. The Pawlowa’s box is a bit shorter, which is supposed to make them good for beginners, however, the part between the box and the rim will crinkle with time, so they are often not preferred for wear on stage. From the current catalogue (http://www.paulsballett.de/katalog/paulsballett_katalog_2012.pdf) I got some more info: there are actually five grades of shank hardness: soft, normal, hard, very hard, and very hard with steel spring (“steel spring” being the literal translation, I have no idea about the technical term in English, but it seems to be part of the sole/shank). Additionally, they manufacture three kinds of tip length and three kinds of heel height (i.e. the part at the back which covers the heel). Leather tip, sewed-on bands. EU sizes 30–45. Since the shoes are not heat-glued, as many nowadays are, they can be readily repaired (actually the guy who fitted me said that a while ago someone brought some in from the early fifties). Wish you all the best, and thanks for your nice work here! In my previous comments I compiled some information on Pauls Pawlowa, but now I would like to relate my personal experience. 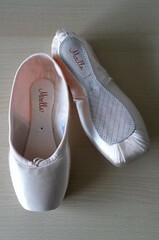 This was my first pair of pointe shoes, and I don’t like them very much. 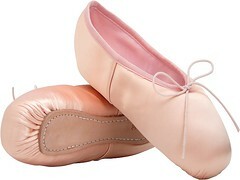 I really like the traditional flair about them, however I believe that more “modern” pointes aren’t for nothing. 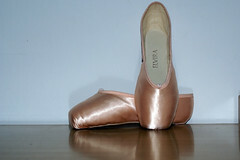 The platform is not very flat as with most pointe shoes I have seen, but rather vaulted. The short box does not give much support. The sole is rather bulky, yet wobbly. 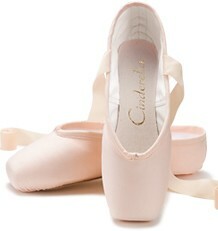 For me, going pointe is a lot easier in other models. After three months of wearing them once a week, a couple of the nails that are hammered in from below came out (which they repaired). These shoes are really traditional. After all, they have been made for 90 years now, and they did not change much. 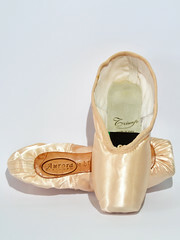 The manufacturer uses this to argue that the shoes must be great, regardless of someones individual feet, even, and especially recommends them to pointe beginners. I rather think that you should acquire the Pawlowa if you want to know how pointe felt a hundred years ago. A lot has changed about pointe shoe manufacturing since then, and one might assume that at least some of the newer technologies actually make lots of sense. Especially, I cannot possibly see how a beginner should benefit from these. Still, there is one fellow student at my dance school who says that this is the only model she is comfortable in. I also started in Pauls (around 1978) and wasn’t happy with them. After changing to a different branch I dissassembled my Pauls and found a box made of plastics (similar to Tupperware) – I honestly doubt that this is the tradional making of pointe shoes. There was no breaking in, no adapting the shoes to my feet at all. However, they came with a small cushion at the inside of the platform for toe protection and comfort. 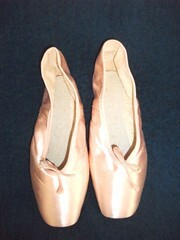 I myself have no pointe shoes from Paul’s but a friend (male) of mine has. He has several pairs of the shoe because they are the only company around here that make shoes in size 46 (american size 12 I think). He is happy with them but he has just started Pointe work and it’s not like he has an opportunity to try a different brand.